The Taste of John Boehners’ Tears | Virginia Right! As I begin to write this, I am unsure whether I will quote the soon to be former Speaker of the House. The left-leaning Republican media in Virginia, New York, and Washington DC are already posting story after story about how unfairly their Dear Leader was treated by the Republican voters. See, we’re too stupid. That’s the problem with Republican politics. Republican voters are just too damn stupid. Yes, you too. You, reading this, you are stupid. See, when Mitch McConnell ran for the Senate on an anti-Obamacare Platform, you were stupid enough to believe him. When John Boehner ran for reelection in Ohio on repealing ObamaCare, you were just too stupid, you believed him. Of course, they are blaming Ted Cruz and Rand Paul for your stupidity. See, you wanted them to defund ObamaCare and Planned Parenthood and Executive Amnesty. Ted Cruz and Rand Paul said that they’d fight for you, to push legislation as far as it would go, as far as it was possible. That forced the leadership in the Republican Party to pretend to agree with Senator Cruz and Senator Paul. In fact, Mitch McConnell ran for reelection on the Rand Paul Platform and John Boehner ran for reelection as Ted Cruz. But its you stupid, stubborn Cruz and Paul supporters who are ruining the Republican Party. Yes, the Republicans are being lied to. They are being lied to by Boehner and McConnell, McCain and Graham, the Washington Times and Bearing Drift. John Boehner announces retirement and then accuses those who oppose him of lying. Why? Because we want votes against ObamaCare – Boehner and McConnell both promised to repeal it. These aren’t serious men. They think of each of you, the republican voter, as an ignorant, worthless, pawn – a rube, an easily manipulated chess piece, a FOXNEWS automaton. John Boehner, has announced, that the truth is that Republicans, in power or out of power, have no power and can accomplish nothing. If John Boehner is right, than anyone voting for a Republican for anything is a complete and utter moron. They never intended to represent you. They laughed their way through reelection. They pretended to be conservatives, they pretended to care. They don’t. Your only role to the GOP Leadership, is the role of a useful idiot. If you refuse to play that role, my friends, they will unleash the most vicious assaults against you. As Republicans you have two choices: blind obedience and submission, or revolution against the Republican Leadership. There is no middle ground. John Boehner and Mitch McConnell, and all the Bush people, Kascich people, and Christie people, are about to fund Obama’s agenda through the end of his term, because they agree with Obama’s agenda. They want Obama’s agenda. They never had any intention of representing you and they never will. These are facts. This is the way things are. If you want to change the Republican Party, you need to change, to exchange, all those who control it. Otherwise, you’ll remain the useful idiots of the rich and powerful – those who care nothing for country, for the economy, or for the future freedom and prosperity of America as a nation. Is it any wonder, that those who seem least contented with government are those who simply are not in the employ of the government or its politicians? If we don’t begin a drastic reduction immediately, we’ll be overrun. Anyone able to make a buck off the Bush Family or the Romney Clan will continue to control the party that used to represent you. Unless you have a hundred million dollars to invest in their power, you will have neither representation nor favored status amongst the elite. 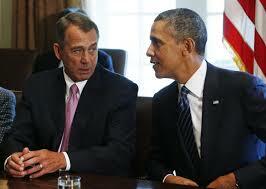 Boehner retiring should not be seen as a victory, but merely the first pawn taken off the chessboard. It’s a step 2. Cantor was step 1. We need a checkmate. We must not rest until we have an entirely clean GOP leadership. Well said Steve. The clear success each election cycle in getting the broad swath who self identify as conservatives, maybe social , fiscal or constitutional , in any event the success the party establishment enjoys in enlisting these troops to do the door to door canvassing , to man the phone banks, hold fund raisers for them still astounds me. It is as if a collective fog settles in on their memories and prohibit them from remembering anything beyond yesterday. A collective amnesia settles in for a brief period, only to leave after the hard work is done , the elections end with maybe a person with an R next to their name–and then deem it a success. Men & women of principle are coming around and recognizing the normal “hold your nose and vote for the least objectionable” is loosing it’s grip. Nothing at all wrong with simply writing in a candidates or non-candidates name if you can not suppress your disdain for a parties nominee. Each cycle I take some comfort in seeing the “win baby win” mindset losing it’s appeal. The folks clamoring for a “win” as if it is some sort of football game , who bask in the glory of a election win, regardless of it’s merit or value , or what it will mean in terms of advancing the conservative cause is losing it’s mindless appeal, the cheering section of political sycophants aside. These are the folks who are so enamored of hanging out with pols, and hinder real progress because of these terribly misaligned priorities. I watch them donate money and have the photographs taken with politicians who manipulate them for their support and then treat them as a distant relative as soon as the votes are counted. Republican ran the state for 4 years in almost total control , at least in terms of setting the table/agenda. Yet what as I have reminded my conservative brethren was achieved ? Largely –nothing. We did however win……just what i’m not quite sure. As we celebrate these hollow victories, things worsen. I encourage every Patriot, Veteran, Christian, grassroots activist, Libertarian, and conservative who cares about this country and is Fed Up with Washington to read the book “How to Bag A Rino” and be inspired that we can, indeed, take our country back one election at a time. Right on. One of my discripter for the elite is parasite. These unlawful elitists are parasites on the working man. If in each district whether it is local state or federal and the candidate is a part of the establishment it is important that they are not supported. That can take place at the polling places, the phone banks the door knocking etc. Do not assist. Vote third party, cross the isle or just don’t vote ,but please don’t help those who are against you. I really have to ask ‘are you not tired of being the Charlie Brown who every year is promised by Lucy that she won’t pull the football away and Charlie falls flat again’?